Having created over 150 video tutorials with Camtasia I’ve come up with a few tips and tricks, especially when creating a video tutorial series. I’ve come across software developers who may be good programmers, but lousy when it comes to creating how-to videos for their product. In a series of videos, it’s best to start with an introduction to the series outlining what the software does, what steps are included and what the final results/benefits will be. If the videos are available for download, the video series folders should be numbered in order (01subject, 02subject, etc.) to keep them in order. Otherwise, when they’re on a computer they end up in alphabetical order. Another option is to include an html page with links in the proper order within the main folder. What I normally do is record in 1024×768, reduce that to 800×600 when importing into Camtasia Studio, then using a lot of Zoom-n-Pan during editing to highlight whatever is important or hard to see. If possible, I zoom to 100% (the original recording size) to make it easier for Camtasia to render the final video, but I often also use 125% or so to zero in on something like a URL in an address bar or whatever size is needed for, let’s say, a popup window. For desktop videos I think that 800×600 is the best size for viewing where you can still see what’s going on. If you use 1024×768 and it plays in a browser, especially one with a bunch of toolbars, it may be too big for some monitors, On the other hand I hate desktop videos on YouTube that are so small you can’t see what’s happening. You can also use widescreen formats like 1280×720 like you would use for uploading to YouTube, but I’ve found I lose too much real estate when recording in 16:9 – most of what is important is in the middle, not on the edges. While it’s not something I’ve done, you also have the option of using a larger cursor. It’s easier to follow on a large screen and I never liked the yellow highlight over the cursor. You can change it in Camtasia Recorder Effects/Options/Cursor or if the ‘Make cursor effects editable’ check box is selected you can change it in the editor. As far as a Full Screen option, I’ve always used Custom Production Settings to produce an mp4, and on the third screen of the Produce and Share wizard, I’ve used the Classic controller, which doesn’t have a full screen option. If you choose Express Show or Overlay Controls you’ll have the Full Screen option on the control bar. One other tip when producing a video: Under HTML Options you can enter your own title for the html page. One note: whenever you produce your next video Camtasia will have the title of whatever the previous video was still there under HTML Options, so you will need to change it for each video you produce. 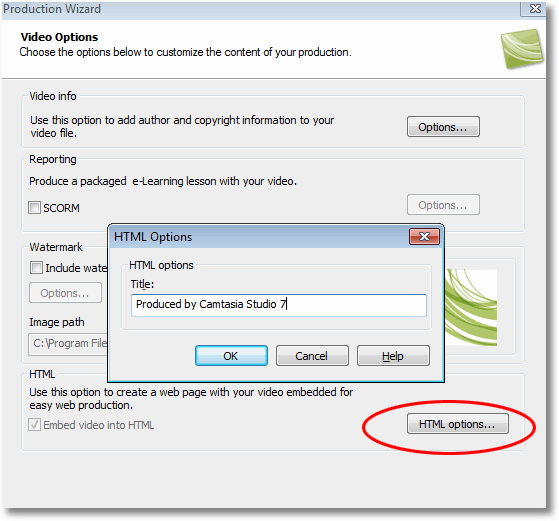 So those are just a few tips and tricks to creating better videos using Camtasia Studio.